A lot of cafes have opened in the past few months. I didn’t make it to all of them, but these are my favorites out of the ones I did visit. This is a running series and the previous edition can be found here. Order is alphabetical. Occupying a giant Industry City ground floor space, the Alpha Dominche Extraction Lab, the Platonic ideal of a coffee shop, purveys coffee, tea, wifi, and Meyers Bageri pastries in a gorgeous space with friendly, knowledgeable service. 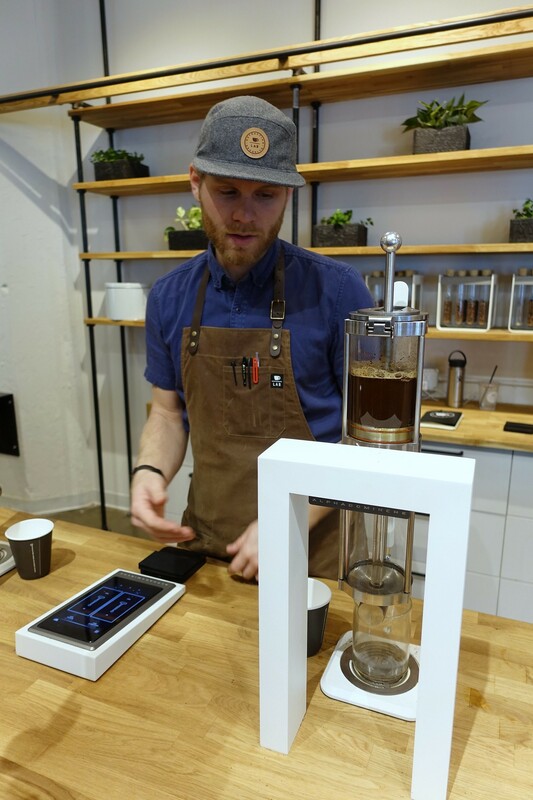 The Lab, open 8am–4pm weekdays, offers an ever-changing menu of coffees (and teas) from a pool of 50 roasters worldwide, prepared using their precision vacuum brewing technology. This spring they plan to offer coffee roasted in-house as well, along with expanded evening and weekend hours. 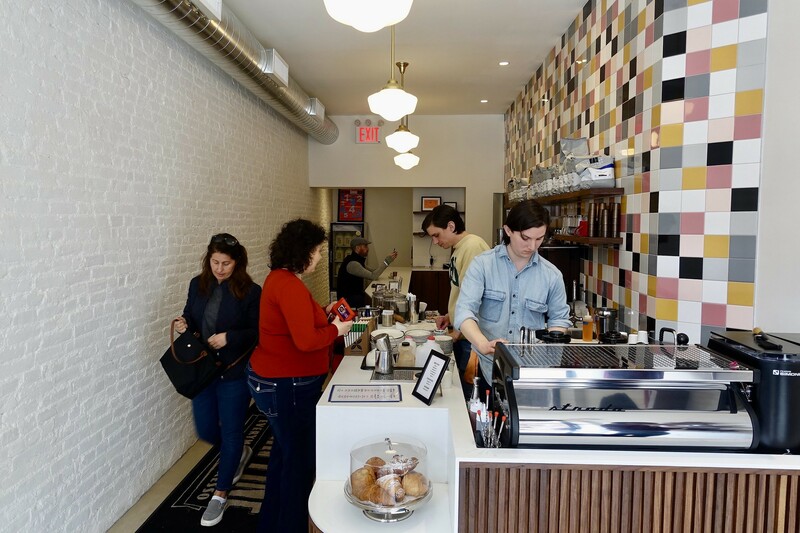 Everyman Espresso has created the perfect hang with their third location on Park Slope’s 5th Ave. The narrow, eight-seat interior, which previously housed another coffee shop, Venticinque, has been left largely intact; Everyman opened up sightlines by removing extraneous crud, beefed up the bar, brightened up the walls with a coat of white, and added their signature multicolored tile behind the bar. 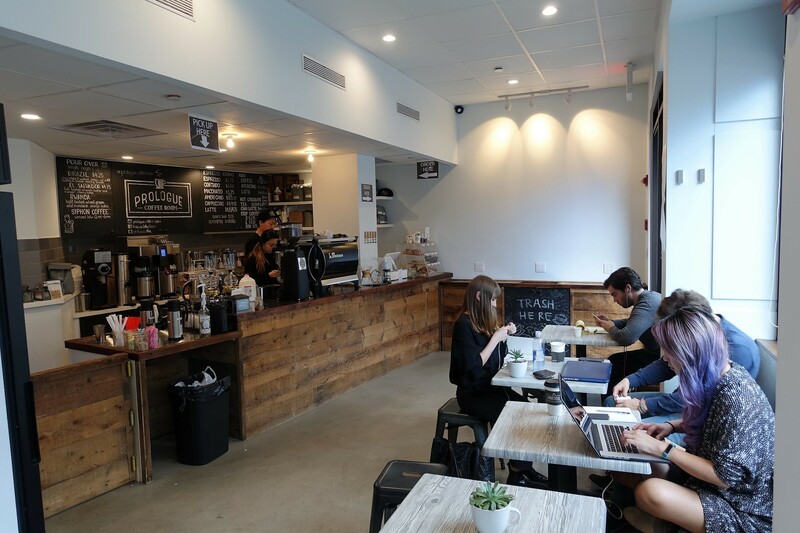 Service is crisp and friendly, the Counter Culture coffee is expertly made, and there’s wifi and a bathroom to boot. Pastries are from Roberta’s, and the house chocolate is supplied by upstate New York bean to bar maker Fruition; unfortunately the dark chocolate flavor is hardly discernable in their milky, American-style hot cocoa. 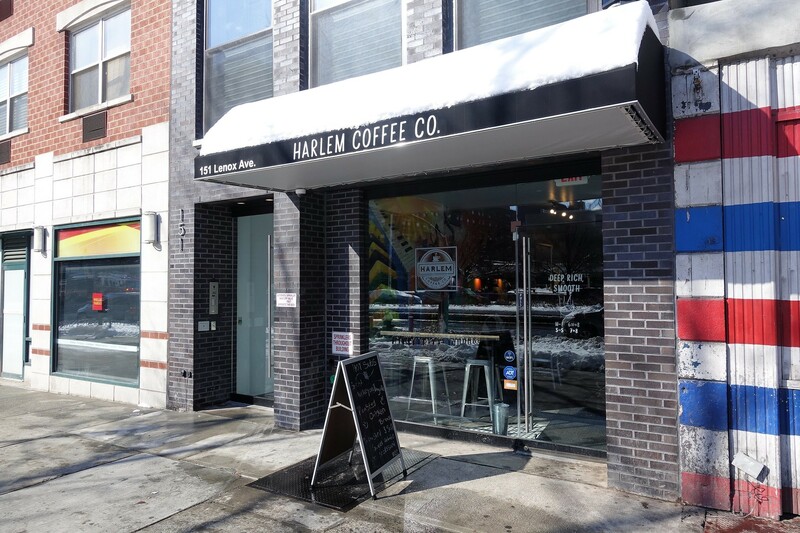 Harlem Coffee Co is a boon to an area previously unserved by specialty coffee, dispensing well-prepared, locally roasted Joe Coffee to locals happy to use the reliable wifi in the somewhat corporate but not unattractive space. There’s a large back room, a plug or two, and a variety of fairly generic sandwiches, bagels and baked goods. 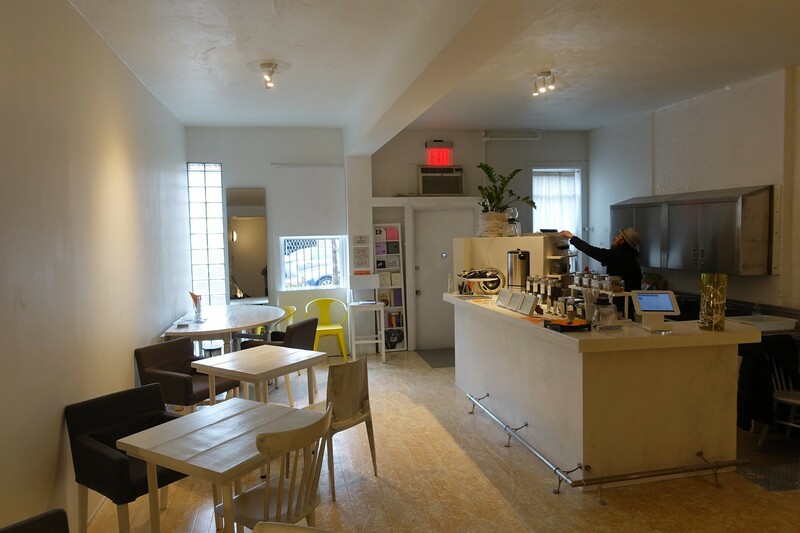 Just off Central Park North, on the southern border of central Harlem, Little Bean Coffee Co occupies a ground floor slice of a generic commercial building. 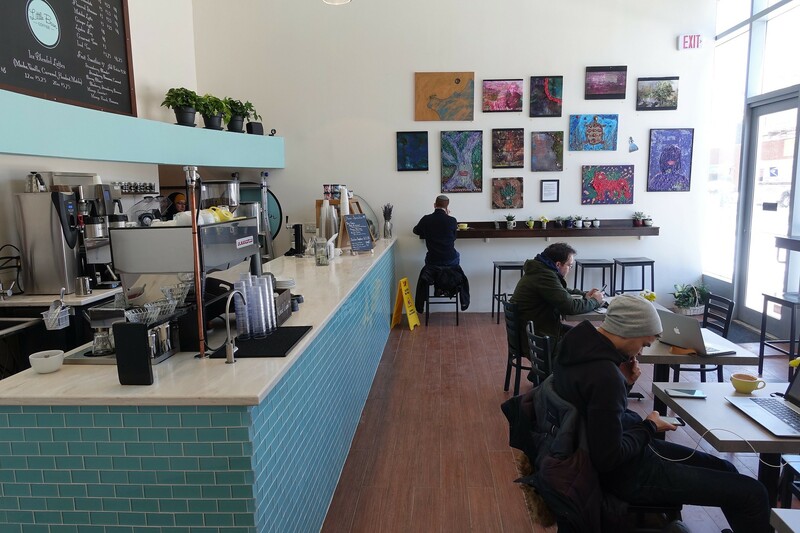 The space is attractive, decorated with robin’s egg blue accents and tile and wonderful local art that belies the anonymous glass exterior. Despite limited seating, a couple of laptop users are dug in for the long haul – wifi is hard to come by hereabouts. The Red House Roasters espresso, served in pleasing yellow demitasse, is dark roasted and harsh. MIRROR tea house is a super chill, Japanese-run cafe and event space with a sparse, all-white aesthetic and some carefully-curated coffee bar ephemera. Four square, white-painted two tops run up the wall opposite the bar and its adjacent couch, while a bathtub and some musical instruments are the sole occupants of the large rear area in this converted residential unit. The coffee is too dark roasted for my taste, but the Nel brewing process brings some flavors to the fore. There are lots of other interesting drinks to explore including banana milk tea, hojicha latte, and others, along with some homemade soups. Music is important here, with delicious hip hop, jazz and other ambient soundtracks playing over the sound system and helping to drown out the traffic sounds from noisy Union St.
Prologue Coffee Room, just off the intersection of Lafayette and Canal, is cookie cutter but fills a void in the neighborhood as the only place within a many block radius where you can get some work done over a decent Toby’s Estate espresso drink or pourover. Service is friendly enough. Wifi. No bathroom. 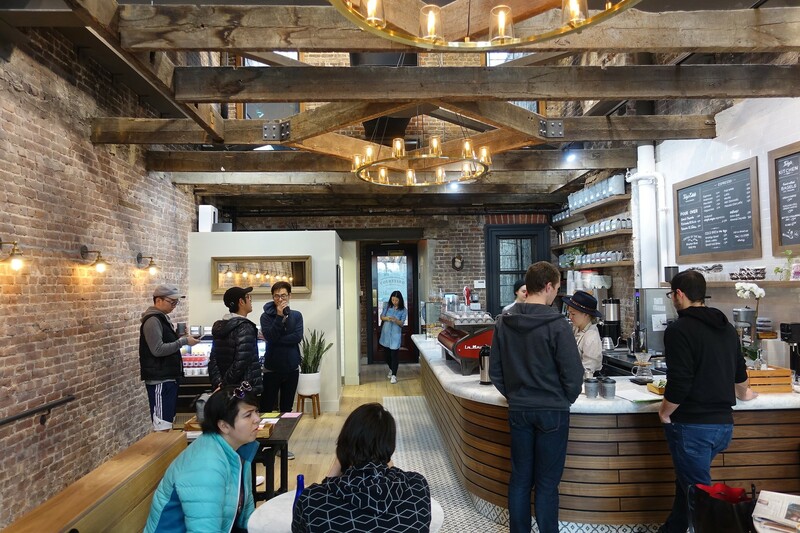 Toby’s Estate Coffee gutted a residential building on Long Island City’s Jackson Ave, in the previously under-served downtown area, and left all three stories open, with unobstructed views up to the top floor save the original wooden beams and two huge, rustic chandeliers. The ground floor has been fashioned into a gorgeous cafe space, with sinuous wooden bench seating, wood and marble tables, reclaimed wide-plank wood flooring, exposed and white-painted brick walls, and a tiled wall behind the bar. Pourovers and espresso drinks are expertly made using their own coffee, roasted at the flagship shop in Williamsburg. The spacious backyard opens in the spring. Very friendly service. Wifi.